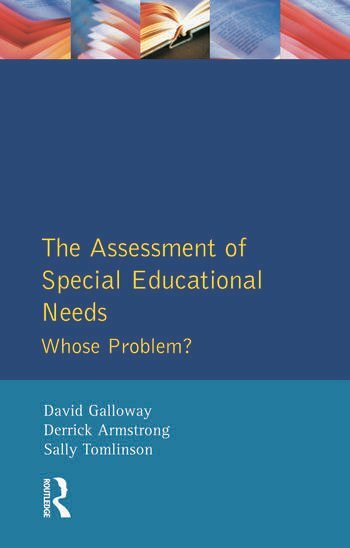 The Assessment of Special Educational Needs: Whose Problem? The debate about special needs provision has increased dramatically over the last 15 years, however, despite the widespread concern over both learning and behavioural difficulties, there have been few attempts to analyse in detail the process of assessment by which children are being identified as having special educational needs. Drawing upon research carried out by the authors, this book fills that gap by examining the process in detail. It considers the assessment process itself and how it affects and is affected by other areas of school policy - in some cases causing tension and conflict such as parental participation, the use and allocation of resources and multi-professional decision-making. A feature of the book is its analysis of the impact of the National Curriculum and the local management of schools (LMS) provision for special needs. 2. The 1988 Education Reform Act: liberator or albatross? 6. Educational psychologists: educationalists, clinicians or resource gatekeepers? 9. Multidisciplinary assessment: Is it justified?